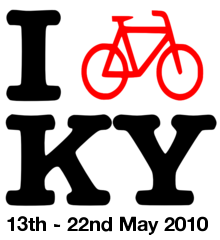 Kerry Bicycle Festival which is currently in it 3rd year seeks submissions of both bike related short films and bike themed art works for this years festival, which takes place from the 13th to the 22nd of May. Cycling Shorts – Not the questionable fashion trend of the early 90s, but a night of short films about and featuring bikes, which will be screened in Blennerville on the 14th of May during this years Kerry Bicycle Festival. The selected films will also be screened at a viewing post in Siamsa Tire for the duration of the festival. Films should be less than 15 minutes long, and there is an award of €500 for the best entry. Deadline for entries is Friday the 7th of May. Due to the success of last years exhibition Frame the bicycle themed art exhibition will be returning this year. We are currently seeking submission of all type of art; photography, sculpture, paintings, illustration, audio and installation, which either features or is inspired by bicycle and cycling. The exhibition will run in the Siamsa Tíre gallery for the duration of the festival, and there is an award of €500 for the best artwork, as well as an opportunity for artists to sell their work. Kerry Bicycle Festival is a free festival which brings together a selection of diverse events which aim to celebrate the bicycle. This festival encompasses musical, artistic and outdoor events all of which are free and will take place within the environs of Tralee town. This festival was established in 2008 in order to raise the profile of cycling culture by making it more accessible and attractive and to promote cycling as an environmentally sustainable and cost effective mode of transport. The Kerry Bicycle Festival is supported by the Dept. of Transport’s ‘Smarter Travel’ fund.